Nanotechnology is rapidly developing subdivision of technology that effects on many fields. Medicine is also influenced by nanotechnology. Nanotechnology modified methods can be used in cancer treatment. Nanotechnology can assist to have better diagnosis with less harmful substance. The use of optical nanoparticles provides efficient drug delivery to tumor cells with liposomes and functionalized micelles. Nanotechnology can be also used in molecular imaging with tomography and photoacoustic imaging of tumors and therapy of cancer as photothermal and radiotherapy. Nanotechnology a next generation techniques have many advantages to treat cancer patients from diagnosis to treatment. Nanotechnology has the potential to offer solutions to these current obstacles in cancer therapies, due to its unique size (1-100 nm) and large surface volume ratios. Nanotechnologies may have properties of self-assembly, stability, specificity, drug encapsulation and biocompatibility as a result of their material composition. The use of nanometer size molecules, which range from 100 nm or even smaller attain their unique properties. Thus, nanotechnology can help in early detection of tumors and oral cancer therapeutics. The most well-studied nanoparticles include quantum dots (QDs), , carbon nanotubes,  paramagnetic nanoparticles,  liposomes,  gold nanoparticles  and many others. , Use of nanoparticles can be from drug screening to drug delivery to diagnosis/monitoring. Nanotechnology has the potential to offer solutions to current obstacles in cancer therapies, due to its unique size (1-100 nm) and large surface-to-volume ratios. Nanoparticles with the size in the range of 200 nm are known to accumulate at the solid tumor site by the enhanced permeation and retention effect. Cell-based biosensors work on the principle that multiple biochemical pathways are followed to translate the molecular code on the oncogenes into a malignant tissue. A living cell can be integrated in a microsystem as the primary transduction mechanism. The cells would detect the key bio-chemical factories/labs laboratories and can amplify a chemical signal. This can be detected by either monitoring physical parameters (such as electrical activity, structural changes) or chemical parameters (production of "messenger" molecules). Bioconjugated particles and devices are also under development for early cancer detection in body fluids such as blood and serum. These nanoscale devices operate on the principles of selectively capturing cancer cells or target proteins. The sensors are often coated with a cancer-specific antibody or other biorecognition ligands so that the capture of a cancer cell or target protein yields an electrical, mechanical, or optical signal for detection. Another promising area of research is the use of nanoparticles for detection and analysis of circulating tumor cells and biomarkers in blood/serum samples. Through the combinatorial use of magnetic nanoparticles and semiconductor QDs, it is possible to increase the ability to capture and evaluate these rare circulating cancer cells. Nanotechnology, an interdisciplinary research field involving chemistry, engineering, biology and medicine, has great potential for early detection, accurate diagnosis and personalized treatment of cancer. There are many subtypes of gold nanoparticles such as gold nanosphere, gold nanocages, gold nanosphere, gold nanorods, surface enhanced raman spectroscopy (SERS) nanoparticles. These metallic gold nanoparticles exhibit a unique optical response to resonantly scatter light when excited at their surface plasmon resonance frequency. The epidermal growth factor receptor is a cell surface receptor biomarker that is over expressed in epithelial cancer but not in normal cell. The antiepidermal growth factor receptor antibody conjugated nanoparticles specifically and homogeneously bind to the surface of cancer type cells with 600% greater affinity than to non-cancerous cell. The successful conjugation of antibodies on gold nanoparticles can be ascertained by the addition of 10% common salt which also leads to aggregation of gold nanoparticles and result in visible color change from red to purple or gray. Gold nanoparticles have been investigated in diverse areas such as in vitro assays, in vitro and in vivo imaging, cancer therapy and drug delivery. Gold nanoshells are capable of enhancing the contrast of blood vessels in vivo suggested their potential use in magnetic resonance (MR) angiography as blood pool agents. One of the promising diagnostic tools for cancer diagnosis is fluorescent nanoparticle such as organic dye doped nanoparticles, QDs that enable highly sensitive optical imaging of cancer at cellular and animal level. Medical physicists at the University of Virginia have created a novel way to kill tumor cells using nanoparticles and light. The technique, devised by Wensha Yang, an instructor in radiation oncology employs QDs. QDs are semiconductor nanostructures, 25 billionths of a meter in diameter, which can confine electrons in three dimensions and emit light when exposed to ultraviolet radiation. QDs are fluorescent nanoparticles with sizes of 2-10 nm that contain a core of 100s-1000s of atoms of group II and VI elements (e.g., cadmium, technetium, zinc and selenide) or group III (e.g., tantalum) and V elements (e.g., indium). , These can be used as photosensitizers and carriers. They can give rise to reactive oxygen species and thus will be lethal to the target cells. Nanoparticles can penetrate through small capillaries, which allow efficient drug accumulation at target sites. A sustained and controlled release of drugs at target sites over a period of days or even weeks is possible. Liposome molecules are easily diffused into the cells; since their structures and cell membrane structure can interact very well while drug uptake process. Silver-based drugs have oligodynamic silver ions which enhance its antimicrobial properties. In 2003, Reitz did a retrospective review on the universal antimicrobial effects of oligodynamic Ag +2 . Reitz documented that many cancer associated infections such as human immunodeficiency virus , human herpesvirus 8,  human papillomavirus  and epstein-barr virus 18,  BK and JC polyomaviruses, respiratory syncytial virus, influenza viruses and parainfluenza viruses, fungemia , rotavirus , cytomegalovirus  and Streptococcus pneumoniae are susceptible to oligodynamic Ag +2 . Advantage of silver particles is their ability to absorb, interact with and destroy bacteria affecting abnormal human tissue in situ or favorably upregulate immune tissues and healing mechanisms. Marino et al. and Berger et al. (1976) confirmed that the effective dosage level of pure oligodynamic Ag + is safe for mammalian tissues. Therefore, based on the studies and from a purely mathematical perspective, 100 cc isotonicb Ag + hydrosol with a 25 ppm concentration or less, could be administered as an intravenous drip every day for a year without risking the development of argyria. Likewise, a dose of 500 cc (isotonic) of oligodynamic Ag + administered daily for up to 79 consecutive days or 1000 cc (isotonic) of oligodynamic Ag + administered daily for up to 39 consecutive days still falls short of the risk threshold for developing argyria. The use of nanoparticles has not only revolutionized the field of medicine but has helped in accurate, precise treatment of diseases, drug delivery. 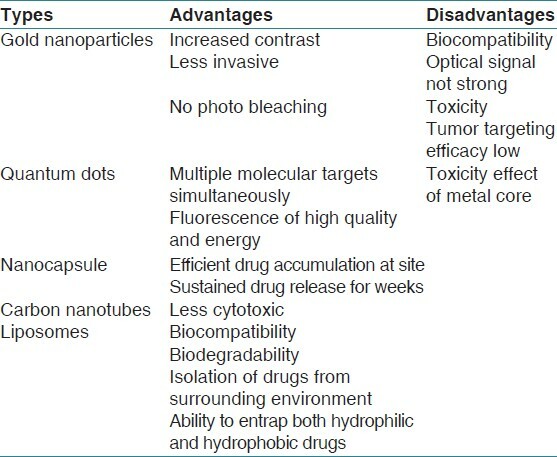 Various other uses of nanoparticles in various fields of medicine and cancer are fluorescent biological labels,  drug and gene delivery,  bio detection of pathogens,  detection of proteins,  probing of DNA structure,  tissue engineering,  tumor destruction through heating (hyperthermia),  separation and purification of biological molecules and cells,  MR imaging contrast enhancement  and phagokinetic studies  [Table 1]. Cancer targeting is highly dependent on surface chemistry. Biocompatibility is a major issue in use of nanoparticles. Ease of availability all over the world at basic levels (primary health care, government hospitals etc.,) and cost of nanotreatment are the main disadvantages of nanoparticles. Vaccine as a form of nanovaccine in the treatment of cancer is still under development. The first type, prophylactic vaccines, triggers humoral and cellular immunity and is administered into healthy individuals in order to prevent them from getting cancer. The human papilloma virus vaccine is an example of a prophylactic vaccine. For those who already have cancer, there is a second type of vaccine called cancer nanovaccines. Cancer nanovaccines could be designed, manufactured and introduced into the human body to improve health, including cellular repairs at the molecular level. The nanovaccines are so small that it can easily enter the cell; therefore, nanovaccines can be used in vivo or in vitro for biological applications. This has led to the development of diagnostic devices, contrast agents, analytical tools, physical therapy applications and drug delivery vehicles. Drug consumption and associated side-effects can be significantly lowered by depositing the active agent at the desired location. Just like radiotherapy for cancer, heat therapy uses nanoparticles and hence that treatment is targeted at the cancer cells. Like radiation therapy, a laser optic probe is used, which basically ensures that the infrared radiation is directed at the tumor and allows the treatment to be through the skin, from outside the body. Therefore, this new heat treatment is very similar to the current method of radiation therapy, but the nanoparticles alter the treatment in that they cause minimal damage to the healthy tissue. Nanoscience and nanotechnology, like any other knowledge and associated practices that were developed in the past are engaged in a debate about the degree of desirability of this technology from different value-premises and interpretations of the new technoscience. In the Western countries, research on ethical, legal, social and environmental dimensions of nanoscience and nanotechnology has been recognized as a legitimate field of inquiry. The fact that nanomedicine is a new development, with nanotechnology treatments being completely different from other cancer treatments, there could be a lot of confusion and difficulty in regulating nanotechnology treatment and its uses. For these reasons, it could be hard to create rules and risk assessments for nanotechnology, which could therefore allow it to be used unsafely. Despite tremendous advances in cancer therapy, many scientific, technological and clinical challenges remain that will require a highly interdisciplinary and collaborative approach to overcome cancer disease. With advances in cancer biology and explosive development in material science and imaging technology, we have reason to be optimistic that we are at the critical threshold of a major breakthrough in the treatment of cancer. As the capabilities of multifunctional nanoplatforms continue to increase, the integration of cancer biology, diagnostic imaging and materials science in the future will be essential, not just for theranostic medicine, but for cancer therapy overall. Multifunctionality is the key advantage of nanoparticles over traditional approaches. Targeting ligands, imaging labels, therapeutic drugs and many other functional moieties can all be integrated into the nanoparticle conjugate to allow for targeted molecular imaging and molecular therapy of cancer. Gold nanoparticle is unique in a sense because of its intriguing optical properties which can be exploited for both imaging and therapeutic applications. Nanoparticles hold new promise as means for earlier detection and better treatment of cancer. Imagine a future where nanoparticles can help detect cancer before it even has a chance to manifest and selectively destroy cancer cells while leaving the normal cells unharmed. Cancer, in such a circumstance, could become a highly manageable condition. However, despite our current research there is much we still do not understand. Nanoparticles offer a new avenue to tackle these challenges. 1. Stewart BW, Kleihues P. World Cancer Report. Geneva: World Health Organization Press; 2003. 2. Nath A, Singh JK, Vendan SE. High risk of oral cancer in North India. Curr Sci 2012;102:556. 3. Parkin DM. Global cancer statistics in the year 2000. Lancet Oncol 2001;2:533-43. 4. Parkin DM, Pisani P, Ferlay J. Estimates of the worldwide incidence of 25 major cancers in 1990. Int J Cancer 1999;80:827-41. 5. Pisani P, Parkin DM, Bray F, Ferlay J. Estimates of the worldwide mortality from 25 cancers in 1990. Int J Cancer 1999;83:18-29. 6. Jemal A, Siegel R, Ward E, Hao Y, Xu J, Murray T, et al. Cancer statistics, 2008. CA Cancer J Clin 2008;58:71-96. 7. Hanahan D, Weinberg RA. The hallmarks of cancer. Cell 2000;100:57-70. 8. Ehdaie B. Application of nanotechnology in cancer research: Review of progress in the National Cancer Institute′s Alliance for Nanotechnology. Int J Biol Sci 2007;3:108-10. 9. Arap W, Pasqualini R, Ruoslahti E. Cancer treatment by targeted drug delivery to tumor vasculature in a mouse model. Science 1998;279:377-80. 10. Peer D, Karp JM, Hong S, Farokhzad OC, Margalit R, Langer R. Nanocarriers as an emerging platform for cancer therapy. Nat Nanotechnol 2007;2:751-60. 11. Brigger I, Dubernet C, Couvreur P. Nanoparticles in cancer therapy and diagnosis. Adv Drug Deliv Rev 2002;54:631-51. 12. McNeil SE. Nanotechnology for the biologist. J Leukoc Biol 2005;78:585-94. 13. Grodzinski P, Silver M, Molnar LK. Nanotechnology for cancer diagnostics: Promises and challenges. Expert Rev Mol Diagn 2006;6:307-18. 14. Cai W, Shin DW, Chen K, Gheysens O, Cao Q, Wang SX, et al. Peptide-labeled near-infrared quantum dots for imaging tumor vasculature in living subjects. Nano Lett 2006;6:669-76. 15. Cai W, Hsu AR, Li ZB, Chen X. Are quantum dots ready for in vivo imaging in human subjects? Nanoscale Res Lett 2007;2:265-81. 16. Liu Z, Cai W, He L, Nakayama N, Chen K, Sun X, et al. In vivo biodistribution and highly efficient tumour targeting of carbon nanotubes in mice. Nat Nanotechnol 2007;2:47-52. 17. Thorek DL, Chen AK, Czupryna J, Tsourkas A. Superparamagnetic iron oxide nanoparticle probes for molecular imaging. Ann Biomed Eng 2006;34:23-38. 18. Park JW, Benz CC, Martin FJ. Future directions of liposome- and immunoliposome-based cancer therapeutics. Semin Oncol 2004;31:196-205. 19. Huang X, Jain PK, El-Sayed IH, El-Sayed MA. Gold nanoparticles: Interesting optical properties and recent applications in cancer diagnostics and therapy. Nanomedicine (Lond) 2007;2:681-93. 20. Ferrari M. Cancer nanotechnology: Opportunities and challenges. Nat Rev Cancer 2005;5:161-71. 21. Taton TA. Nanostructures as tailored biological probes. Trends Biotechnol 2002;20:277-9. 22. Whitesides GM. The ′right′ size in nanobiotechnology. Nat Biotechnol 2003;21:1161-5. 23. Hede S, Huilgol N. "Nano": The new nemesis of cancer. J Cancer Res Ther 2006;2:186-95. 24. Saunders SA. Current practicality of nanotechnology in dentistry. Part 1: Focus on nanocomposite restoratives and biomimetics. Clin Cosmet Investig Dent 2009;1:47-61. 25. Gordon N, Sagman U. Nanomedicine Taxonomy. Canada. Canadian Institutes of Health Research (CIHR) NanoBusiness Alliance; 2003. 26. Aliosmanoglu A, Basaran I. Nanotechnology in cancer treatment. J Nanomedicine Biotherapeutic Discov 2012;2:107. 27. Cai W, Chen K, Li ZB, Gambhir SS, Chen X. Dual-function probe for PET and near-infrared fluorescence imaging of tumor vasculature. J Nucl Med 2007;48:1862-70. 28. Reddy PS, Ramaswamy P, Sunanda C. Role of gold nanoparticles in early detection of oral cancer. J Indian Acad Oral Med Radiol 2010;22:30-3. 29. El-Sayed IH, Huang X, El-Sayed MA. Surface plasmon resonance scattering and absorption of anti-EGFR antibody conjugated gold nanoparticles in cancer diagnostics: Applications in oral cancer. Nano Lett 2005;5:829-34. 30. Kah JC, Kho KW, Lee CG, James C, Sheppard R, Shen ZX, et al. Early diagnosis of oral cancer based on the surface plasmon resonance of gold nanoparticles. Int J Nanomedicine 2007;2:785-98. 31. Sha MY, Xu H, Penn SG, Cromer R. SERS nanoparticles: A new optical detection modality for cancer diagnosis. Nanomedicine (Lond) 2007;2:725-34. 32. Ramanujan K. Like burrs on your clothes, virus-size capsules stick to cells to target drug delivery. Chronicle Online 2009. 33. Gao X, Yang L, Petros JA, Marshall FF, Simons JW, Nie S. In vivo molecular and cellular imaging with quantum dots. Curr Opin Biotechnol 2005;16:63-72. 34. Medintz IL, Uyeda HT, Goldman ER, Mattoussi H. Quantum dot bioconjugates for imaging, labelling and sensing. Nat Mater 2005;4:435-46. 35. Gao X, Cui Y, Levenson RM, Chung LW, Nie S. In vivo cancer targeting and imaging with semiconductor quantum dots. Nat Biotechnol 2004;22:969-76. 36. Yezhelyev M, Morris C, Gao X. Multiple profiling of human breast cancer cell lines with quantum dots - Ab conjugates. Proc Am Assoc Cancer Res 2005;46:510. 37. Yezhelyev M, Morris C, Gao X. Simultaneous and quantitative detection of multiple biomarkers in human breast cancers using semiconductor multicolor quantum dots breast cancer research and treatment. Breast Cancer Res Treat 2005;94 Suppl:S48. 38. Yezhelyev M, Gao X, Markus A. Multiplex molecular diagnostic of tumor tissue using quantum dots. Proc Am Soc Clin Oncol 2005;23:843. 39. Yezhelyev MV, Gao X, Xing Y, Al-Hajj A, Nie S, O′Regan RM. Emerging use of nanoparticles in diagnosis and treatment of breast cancer. Lancet Oncol 2006;7:657-67. 40. Schleyer TL. Nanodentistry. Fact or fiction? J Am Dent Assoc 2000;131:1567-8. 41. Chakravarty P, Marches R, Zimmerman NS, Swafford AD, Bajaj P, Musselman IH, et al. Thermal ablation of tumor cells with antibody-functionalized single-walled carbon nanotubes. Proc Natl Acad Sci U S A 2008;105:8697-702. 42. Kam NW, O′Connell M, Wisdom JA, Dai H. Carbon nanotubes as multifunctional biological transporters and near-infrared agents for selective cancer cell destruction. Proc Natl Acad Sci U S A 2005;102:11600-5. 43. Broadwith. Are Nanotubes the Future for Radiotherapy? Available from: http://www.rsc.org/chemistryworld/News/2010/September/01091001.asp. [Last accessed on 2010 Sep 01]. 44. Gottesman MM, Fojo T, Bates SE. Multidrug resistance in cancer: Role of ATP-dependent transporters. Nat Rev Cancer 2002;2:48-58. 45. Peer D, Margalit R. Fluoxetine and reversal of multidrug resistance. Cancer Lett 2006;237:180-7. 46. Lansdown AB. Microbial multidrug resistance (mdr) and Oligodynamic silver. J Wound Care 2002;11:125-30. 47. Spano JP, Carcelain G, Katlama C, Costagliola D. Non-AIDS-defining malignancies in HIV patients: Clinical features and perspectives. Bull Cancer 2006;93:37-42. 48. Fields CB. Method for treating blood borne viral pathogens such as immunodeficiency virus. United States Patent No. 6,066,489. [2000 May 23]. 49. Sola P, Bedin R, Casoni F, Barozzi P, Mandrioli J, Merelli E. New insights into the viral theory of amyotrophic lateral sclerosis: Study on the possible role of Kaposi′s sarcoma-associated virus/human herpesvirus 8. Eur Neurol 2002;47:108-12. 50. Kuck D, Lau T, Leuchs B, Kern A, Müller M, Gissmann L, et al. Intranasal vaccination with recombinant adeno-associated virus type 5 against human papillomavirus type 16 L1. J Virol 2006;80:2621-30. 51. Serraino D, Piselli P, Angeletti Cl, Scuderi M, Ippolito G, Capobianchi MR. Infection with Epstein-Barr virus and cancer: An epidemiological review. J Biol Regul Homeost Agents 2005;19:63-70. 52. Abelson JA, Moore T, Bruckner D, Deville J, Nielsen K. Frequency of fungemia in hospitalized pediatric inpatients over 11 years at a tertiary care institution. Pediatrics 2005;116:61-7. 53. Knapp KM, Flynn PM. Newer treatments for fungal infections. J Support Oncol 2005;3:290-8. 54. Liakopoulou E, Mutton K, Carrington D, Robinson S, Steward CG, Goulden NJ, et al. Rotavirus as a significant cause of prolonged diarrhoeal illness and morbidity following allogeneic bone marrow transplantation. Bone Marrow Transplant 2005;36:691-4. 55. Chemaly RF, Torres HA, Hachem RY, Nogueras GM, Aguilera EA, Younes A, et al. Cytomegalovirus pneumonia in patients with lymphoma. Cancer 2005;104:1213-20. 56. Marino AA, Berger TJ, Becker RO, Spadaro JA. The effect of selected metals on marrow cells in culture. Chem Biol Interact 1974;9:217-23. 57. Bruchez M Jr, Moronne M, Gin P, Weiss S, Alivisatos AP. Semiconductor nanocrystals as fluorescent biological labels. Science 1998;281:2013-6. 58. Mah C, Zolotukhin I, Fraites TJ, Dobson J, Batich C, Byrne BJ. Microsphere-mediated delivery of recombinant AAV vectors in vitro and in vivo. Mol Ther 2000;1:S239. 59. Edelstein RL, Tamanaha CR, Sheehan PE, Miller MM, Baselt DR, Whitman LJ, et al. The BARC biosensor applied to the detection of biological warfare agents. Biosens Bioelectron 2000;14:805-13. 60. Nam JM, Thaxton CS, Mirkin CA. Nanoparticle-based bio-bar codes for the ultrasensitive detection of proteins. Science 2003;301:1884-6. 61. Mahtab R, Rogers JP, Murphy CJ. Protein-sized quantum dot luminescence can distinguish between "straight", "bent", and "kinked" oligonucleotides. J Am Chem Soc 1995;117:9099-100. 62. Ma J, Wong H, Kong LB, Peng KW. Biomimetic processing of nanocrystallite bioactive apatite coating on titanium. Nanotechnology 2003;14:619-23. 63. Yoshida J, Kobayashi T. Intracellular hyperthermia for cancer using magnetite cationic liposomes. J Magn Magn Mater 1999;194:176-84. 64. Molday RS, MacKenzie D. Immunospecific ferromagnetic iron-dextran reagents for the labeling and magnetic separation of cells. J Immunol Methods 1982;52:353-67. 65. Weissleder R, Elizondo G, Wittenberg J, Rabito CA, Bengele HH, Josephson L. Ultrasmall superparamagnetic iron oxide: Characterization of a new class of contrast agents for MR imaging. Radiology 1990;175:489-93. 66. Parak WJ, Boudreau R, Gros ML, Gerion D, Zanchet D, Micheel CM, et al. Cell motility and metastatic potential studies based on quantum dot imaging of phagokinetic tracks. Adv Mater 2002;14:882-5. 67. Salata O. Applications of nanoparticles in biology and medicine. J Nanobiotechnology 2004;2:3.